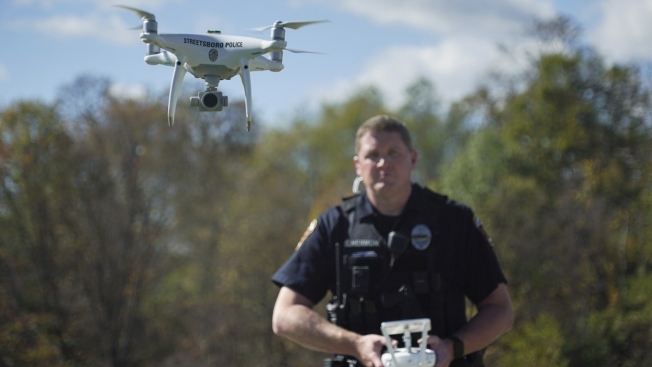 In this Oct. 16, 2017, file photo, Streetsboro Officer Scott Hermon pilots the department's first drone in Streetsboro, Ohio. The number of public safety agencies with drones has more than doubled since the end of 2016, according to data collected by the Center for the Study of the Drone at New York's Bard College. No longer a novelty, drones are becoming an everyday tool for more police and fire departments, new research has found. The number of public safety agencies with drones has more than doubled since the end of 2016, according to data collected by the Center for the Study of the Drone at New York's Bard College. The center estimated that just over 900 police, sheriff, fire and emergency agencies now have drones, with Texas, California, and Wisconsin leading the way, the study showed. 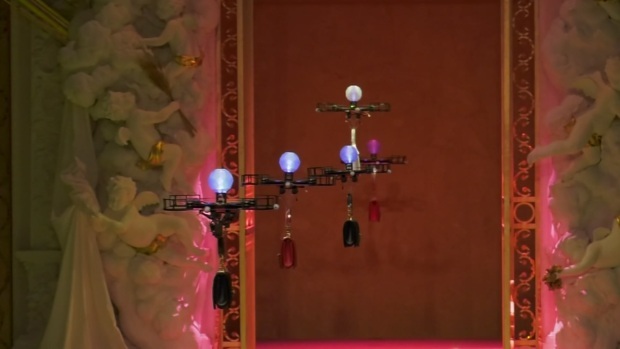 While many law enforcement drone units are just getting started and are in place in just a fraction of the public safety agencies around the country, police and fire departments are continuing to find new uses for the remote-controlled aircraft. They're being deployed to take photos of car accidents, guide firefighters through burning buildings and search for missing people and murder suspects. Some believe they will change policing much like laptops in patrol cars, two-way radios and K-9 units. "With this new environment we're in with active shooters and mass shooters, you can be all over a school campus and see everyone who's running out," said Grady Judd, a Florida sheriff, who this year used money from drug seizures to buy 20 drones to cover all of Polk County night and day. He stressed that the drones will be used only in emergency situations and not to spy on people. About a third of states, including Florida, require police to get a warrant before using drones in a criminal investigation. Using drones, Judd said, is much cheaper than sending up a helicopter and allows for a faster response. Those equipped with thermal imaging can spot suspects at night. "You can have a bad guy in a clump of palmettos pointing a gun at you and you can't see him at all," he said. "Every agency will have these teams in the future." A drone captured stunning video of the widespread damage in Santa Rosa, California, after a wildfire ripped through residential neighborhoods, shopping centers and commercial areas. Most public safety agencies with drones have just one, said Dan Gettinger, co-director of the drone research center. "These agencies are the test cases," he said. "A lot of these programs are still in their infancy." The center's research showed that more than twice as many agencies own drones as do those that operate helicopters and planes. Police in Superior, Wisconsin, flew a drone over a refinery fire in April to help firefighters see through thick smoke. "We never envisioned working with the firefighters, but now that we have the drone, it makes total sense," said Officer Bradley Jago, a drone pilot. Most of the agencies with drones are smaller departments in rural and smaller departments, unlike users of manned aircraft operations, which are centered in heavily populated places. In what local authorities are calling a "world first," a drone helped save two swimmers struggling to reach shore in Lennox Head, Australia on Jan. 18, 2018. Two teenagers were spotted struggling against rough waves when a drone was deployed to drop off a life raft. The sheriff's office in Ohio's Putnam County, a rural area dominated by farmland, added a drone last year after a deputy brought his own drone from home to help search for two men who broke into a farm building. "We realized how useful it could be," said Sheriff Brian Siefker, who said the department has since used the drone on accident investigations and to search for marijuana growing in cornfields. "The possibilities are endless."